Ticket Bureau Reviews 2019 | Is TicketBureau.com Legit & Safe? Is Ticket Bureau Legit, Reliable & Safe in 2019? 1. What is TicketBureau and is TicketBureau Legit? Read on if you’re looking for a TicketBureau.com review that will give you the full scoop on this European-based ticket website. 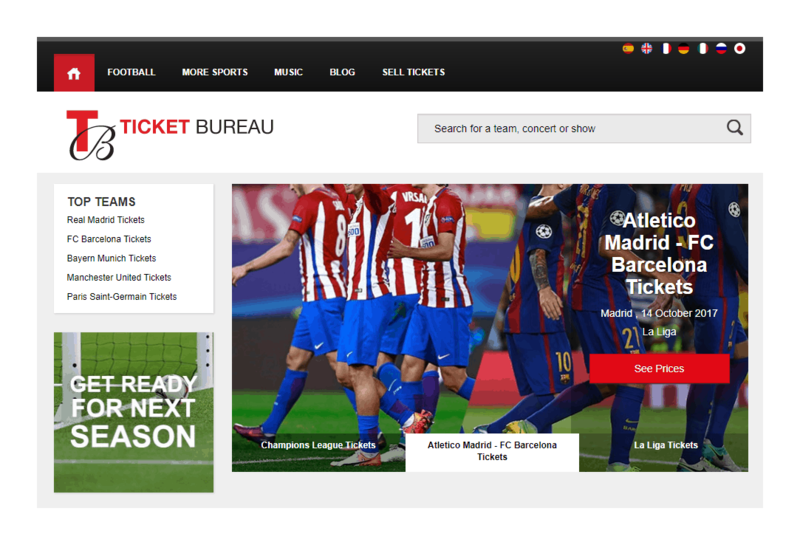 As the official ticket agent for some of the most popular European football teams, including Manchester United and Real Madrid, this site can offer fans great seats to big matches at the best prices available. They also have tickets on-hand to other types of sporting events as well, like rugby, tennis, and motorsports, or games abroad, including baseball, basketball and American-rules football. Not only that, you can find worldwide concert tours and London or Broadway shows on TicketBureau.com, making it much easier to locate tickets to anything that you need on one convenient website. TicketBureau.com can offer fans great seats to big matches at the best prices available. 2. What’s Good about Ticket Bureau? Aside from their ability to beat any competitor’s price on a huge selection of tickets, this seller stands out in another important way. Unlike most other ticket agents, TicketBureau.com offers its buyers a cancellation service to ensure that they’re never left holding a ticket to an event that they can’t attend. Just purchase the service at the time that you pay for your ticket and if you can’t make it, give the company at least 48 hours notice before the event. You’ll receive a 100% refund on the price that you paid, with no questions asked. This handy feature alone is enough to add some serious customer service points. Unlike most other ticket agents, TicketBureau.com offers its buyers a cancellation service. 3. What’s Not so Good about Ticket Bureau? If you’ve bought your tickets through the site’s Ticket Platform or Ticket Exchange programs, this means that the price that you paid for them could, in fact, be more than their face value. These icons indicate that TicketBureau.com isn’t the seller, so they don’t actually set the ticket price. Keep in mind that this is generally the case when you’re buying tickets from a third-party vendor and that tickets for sold-out events can often go for several times their original cost. While the website does charge their sellers a small fee for facilitating the transaction, they are not the ones responsible for tickets with heavily-inflated prices. Prices could in fact be more than their face value. 4. Overall: Is TicketBureau Good, Reliable, and a Safe Site? Overall, even with some positive feedback, there are mixed reviews for Ticket Bureau at this time. The company has, for the most part, a good reputation for delivering legitimate tickets to its buyers and for providing excellent customer service any time that it’s called for. There’s no reason to be concerned about the security of your personal or financial details on their website either since they guarantee a safe and secure transaction every time that you shop with them. If you’re in the market for tickets to an event in Europe or North America, you’ll definitely want to give TicketBureau.com the chance to show you that they have what it takes to be a global ticket leader. I wouldn’t advise anyone to use this site to buy tickets of any kind. I bought a ticket to the game of Real Madrid Vs Barcelona this past December and two days before the game canceled my purchase (which by the way was too expensive, almost 800 Euros), telling me that I would reimburse the entry, to the day I receive a mail telling me that my money had been refunded but that it would take a few days, the days passed and I never received my money so I contacted the site (by email as it is the only way to communicate with them, a way nothing professional for a site that is said to be safe and reliable … I’m sure they do it to avoid having to fight with people who want to complain about the way they “steal” their customers) and they tell me they can not refund my money !! When they had already sent me an email saying that the money had already been reimbursed! I wrote again asking for an explanation to which they just go stupid and only tell me that they will contact me later … Until now I have not received a single penny of my money …. To anyone who is reading my comment (complaint) and believe that I am lying, I can gladly provide you with the emails and the copy of the payment of the entry … Finally I just want to say that I do not recommend anyone to buy through this site .. They are a FRAUD!